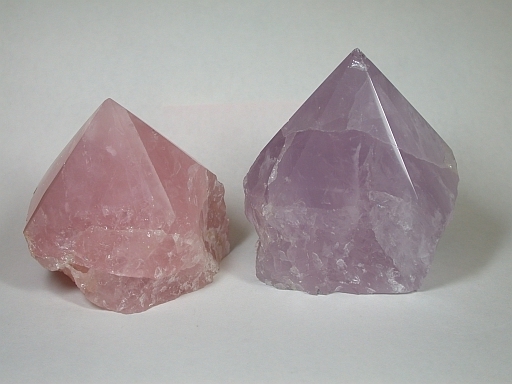 Rose quartz is one of several colored varieties of quartz. At various times in the past it was believed that the color came from colloidal gold, manganese impurities, rutile needles and iron and titanium in the quartz which caused Fe2+-Ti4+ charge transfer. Rose quartz is not always rose. The color can vary from rose to lavender to blue-lavender. Former graduate student Julia Goreva examined the cause of color of rose quartz. After studying samples from localities throught the world, Goreva found that the color comes from pervasive, rose-colored fibers of another phase in the quartz. She isolated and purified the rose colored fibers from rose quartz from a number of localities worldwide, and has shown that the optical absorption spectrum of the fibers is a close match to the optical absorption pattern of bulk rose quartz. Scanning electron microscope images of the fibers show that they can be on the order of 0.1 micrometer in diameter and over 1 cm in length. Further details on the description of these fibers and their properties is available at our recent publications web site. The X-ray diffraction patterns, Raman and infrared spectral properties of the fibers are generally similar those of dumortierite, but differ in a number of fine details. The most distinctive differences are in the Raman spectra. 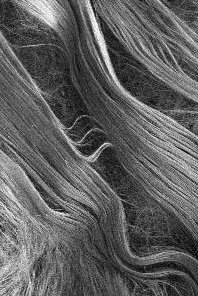 A former post doctoral researcher, Ma Chi, characterized these fibers with transmission electron microscopy. The electron diffraction patterns indicate that the fibers are a previously uncharacterized mineral phase related to dumortierite. This work is discussed in our recent publications. A structural model was developed to interpret the lattice image photos and unit cell constants of the new phase. It indicates that the fibers have a structure which is based on a superstructure of dumortierite. Light element analyses of the new phase with infrared spectra and electron energy loss spectroscopy confirm that it contains the borate ion.